Clearly, it’s time for a field guide to trees and shrubs. I don’t know them nearly as well as I’d like, and this year’s exceptional color has made me aware of how much variety we have. 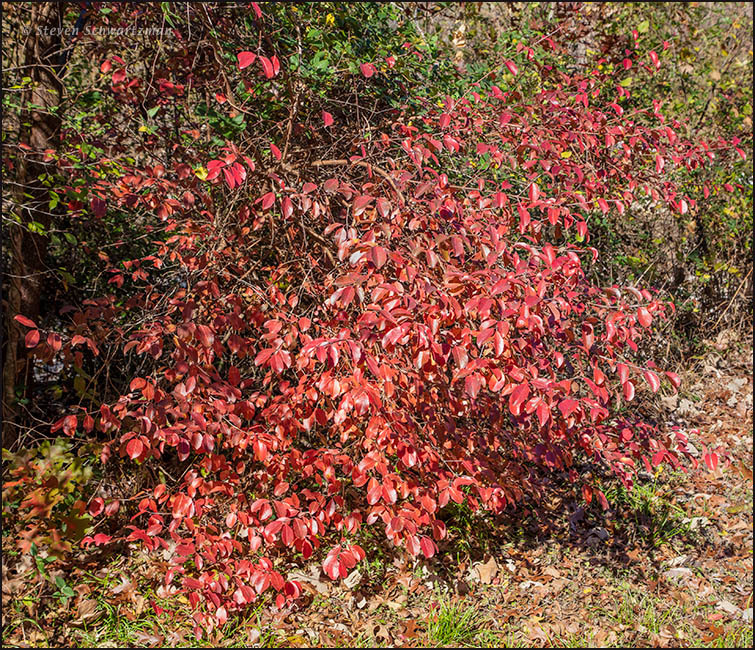 Rusty blackhaw is listed in my area, too, so I need to look more closely at some of the ground-level red I’m seeing. The yellow and red combination in the second photo is especially appealing. On the linked page about reclassification, I laughed at a double meaning of the phrase “the elders are mostly shrubs.” Some of us are, I suppose: staying put in one place and spreading. It’s a characteristic I hope to avoid. I’m also weak on trees and shrubs. I long ago bought several field guides but even with them I still often have trouble identifying what I see out there in nature. 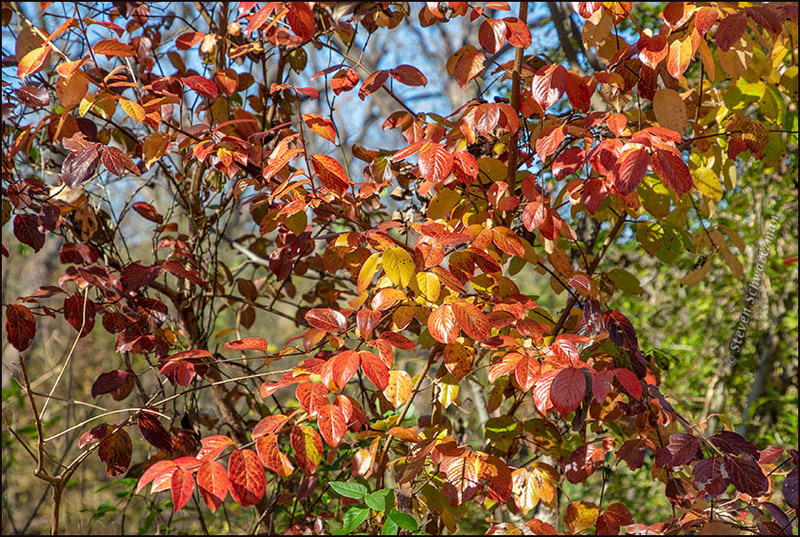 Now that you know about rusty blackhaw and that it grows in your part of the state, you can be on the lookout for it next fall. I know of one that grows in my nearby Great Hills Park, though I didn’t check it out this season. Your “staying put and spreading” is a funny take on the elders of this species being mostly shrubs. Let’s hope they haven’t lost their voice and that they continue to be colorful elder statesmen. I confirmed on the USDA map that people have found rusty blackhaw in Gillespie County, so perhaps you’ve seen some doing its autumn thing. This is the one you just sent me the link about. I have a LOT of catching up to do. I have not been able to get online for days. Sometimes getting away from something can be good. I’ve refused to watch any national television news for a week, and I feel quite happy about it. Well, I did not do it intentionally. I just got very sick. I’m sorry to hear it and glad you’re better. In my case I got sick of television news. I was very fortunate that the guys at work had just rented me a cabin where we work, so was completely without so called ‘news’ through the whole process. (The Conference Center was closed through Christmas, but they got me a cabin anyway.) I feel badly that I was sick through the entire duration of their excellent gift of nine days in a luxurious cabin, but I was fortunate to be in such a comfortable place while so sick! I suspect many people haven’t heard of that family. Those drawings of yours won’t be out of date unless you’ve written the scientific names on them. Even then, you can add a line to each with the new classification. Actually what I do is simply cite my source. That way it marks my place in time. This was my intent all along, knowing full well that there would be changes. However, I did not foresee how extensive the changes would be over the past few years.